Report claims US and Egypt spoke of convening summit in summer that would gather Arab states to address renewal of Israel-Palestinian talks. The US is reportedly considering a “peace summit” this summer that will see the US host Middle Eastern countries to discuss a renewal of negotiations between Israel and the Palestinians. The Arab Peace Initiative, unveiled in 2002 and re-endorsed at the 2007 Arab League summit, says that 22 Arab countries will normalize ties with Israel in return for an Israeli withdrawal from Judea and Samaria. 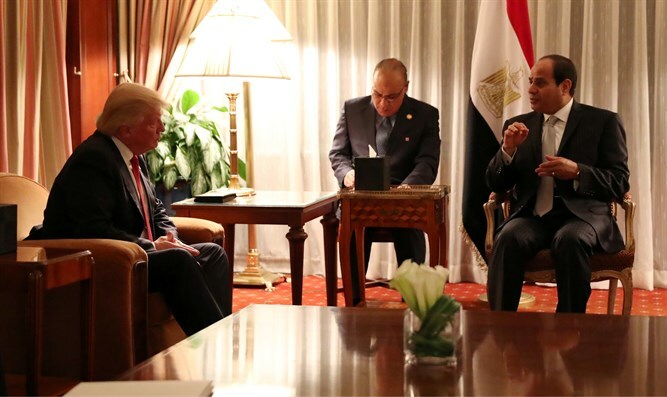 American officials told the paper that one of the ideas that arose during the US-Egypt talks in Washington was the convening of a peace summit this summer that would be hosted by the US. Trump’s special envoy to the Middle East Jason Greenblatt reportedly spoke with Arab officials about the proposal, as the US expects Egypt, Jordan, and Persian Gulf states to play an active role in urging the Palestinians to the negotiating table. The report comes within the context of talks between the US and Egypt on Monday, as the two countries seek to reboot their relations. "We agree on so many things," Trump said at the start of his meeting with al-Sisi, adding, "I just want it to be clear that we stand 100 percent behind President al-Sisi, and he did a great job when his country suffered difficult times."